James “Whitey” Bulger, who is alleged to have murdered at least 19 people, has been arrested. This is a redemptive act for the FBI, just as the finding of Bin Laden was a redemptive act for the CIA. Bulger spent the 1980’s working as an informant for the FBI, at the same time he was building his criminal empire in Boston. It was an FBI agent who tipped Bulger off that the police were about to arrest him in 1994. Ever since then the feds have been trying to wipe that particular egg off their face. Police have searched all over the world for Bulger, but it appears that he has spent the last 14 years living in a rent-controlled apartment in Santa Monica, along with his girlfriend, Catherine Greig. Judging from what I’ve seen of the building in the TV reports, it is one of those drab, ticky-tacky apartment buildings that are all too common in the Los Angeles area. Comfortable enough to live in, but it is not something you would find particularly enjoyable or satisfying. (The place is called the “Princess Eugenia”, which fits in with L.A.’s long tradition of giving silly, pretentious names to drab apartment buildings.) Bulger didn’t own a car. According to their neighbors, Bulger and Greig would go shopping at the local 99 Cents Only Store. (I’m not making this up.) Police found hundreds of thousands of dollars in cash in Bulger’s apartment. No doubt this is all because Bulger was afraid that if he spent all this money, he would draw attention to himself. It was too risky for him to even put his money in a bank account. Bulger’s frugal way of life is probably the reason why it took the police so long to find him. No doubt the feds were looking for a big spender. It appears that Bulger’s only luxury was that he happened to live within walking distance of the beach. He killed nineteen people for that? 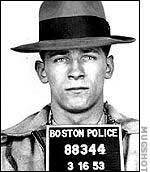 Bulger was born in poverty, which is presumably why he turned to a life of crime. Yet in the end, for all his machinations, his life was like that of a typical retiree living on a fixed income. Bulger illustrates what I call the paradox of the criminal life. For example, a guy robs a million dollars from a bank, but then he can’t spend it without making the police suspicious. Al Capone’s fellow mobsters chided him for his opulent way of life, and they were right, for it was the IRS that finally brought him down. James M. Cain touches upon this paradox in his novel, Double Indemnity. The protagonist has an affair with another man’s wife. He persuades her that they should kill her husband and make it look like an accident, so they can collect his life insurance. After they kill the guy however, they find they can’t have any contact with each other without arousing suspicion. The novel ends with the main character losing his mind. I’m curious to know about the state of Whitey’s mind. This entry was posted on June 25, 2011 at 6:57 am and is filed under Boston, Crime, Los Angeles. You can follow any responses to this entry through the RSS 2.0 feed. You can leave a response, or trackback from your own site.